Pick the right transformer for your Ring Doorbell Pro. The Ring Doorbell Pro is one of the most popular smart doorbells on the market and thousands of people across the country have raced to install the new doorbells. With Amazon's acquisition of Ring, I'm sure there are many feature upgrades in the pipeline. They have good picture quality and integrate well the existing suite of ring products. We've been flooded with questions about what transformer to use with Ring Doorbell Pro and some of the common questions that come up during installation. So we tapped into our home automation partner companies Same Day Smart Homes & Greenfii to solve some of the questions we've been asked related to providing power to the Ring Pro Doorbell and what transformer to use with the Ring Doorbell Pro. What voltage does the Ring Pro Doorbell require? The Ring Doorbell Pro requires a constant power supply with a voltage between 16V-24V and at least 30VA of amperage. Our smart home pros have found that in the midwest only about 20% of homes built before 1995 have enough voltage to supply a Ring Doorbell Pro. What this means is that to get enough power for your Ring Doorbell Pro you might need to upgrade your existing transformer. Most older homes only have 10V transformers which don't provide enough voltage for the Ring Doorbell Pro and will not allow for your Ring Pro Doorbell to function properly. What does a doorbell transformer look like? How do I know my transformer has enough power for Ring Pro Doorbell? Where can I find my doorbell transformer? Here's what an existing installed transformer looks like installed on an old junction box. This is an example of a transformer that needed to be replaced because it did not provide enough voltage. Existing low voltage transformer located in basement that did not provide enough power for the Ring Doorbell Pro. This Transformer was replaced with a higher voltage transformer. Where can you find your existing doorbell transformer? Existing doorbell transformers are typically found in the basement or near an electrical panel. Sometimes they are in crawl spaces or attics. Usually if your home has a basement they will be located close to the electrical panel if it is also located in a basement. How can you tell if your existing transformer has enough power for the Ring Doorbell Pro? If you unscrew your old doorbell you will see that there are two wires running to it and two terminals. You can take a multi-meter and measure the voltage across the two terminals. If it reads in the range of 16V-24V you most likely have enough power for your Ring Doorbell Pro, but you sill need to check the amperage. We recommend the multi-meter below because it is the simplest to use without extensive knowledge of electrical workings. It has auto-ranging meaning you only need to turn the multimeter to the correct dial and it will tell what the voltage is. The correct "dial" setting to measure voltage is the "V" with the lines on top. Even if your voltage is reading 16V you still need to check that you have 30VA of amperage from the transformer as this is the recommended amperage requirements from the manufacturer of the Ring Pro Doorbell. If you are able to find your transformer you can inspect it and 95% of the time it will have the rating directly on the front side of the transformer where the wires come off. If the transformer says it is 10V it is not compatible. If the transformer says 16V or 24V then it is most likely compatible with the new nest hello doorbell. Below we show you what a non compatible transformer looks like and two options for compatible transformers if you end up replacing your existing doorbell transformer. You also need to check the amperage rating of the transformer, it is typically written as VA in the picture below it shows a transformer not compatible with ring doorbell pro that has only 10V (voltage) and 5VA (amperage rating). The Ring Doorbell pro requires 30VA of amperage for power, so you could potentially have a transformer that is 16V but does not provide enough amperage. Checking the amperage rating of the transformer you are using with the Ring Doorbell is important. If your existing transformer is 16V or 24V and looks like either of the below with an amperage rating of at least 30VA, your existing transformer is compatible with the Ring Pro Doorbell. You can also click on the image below and it will take you too the two transformers we recommend for the Ring Pro Doorbell that we have tested that we know will work. 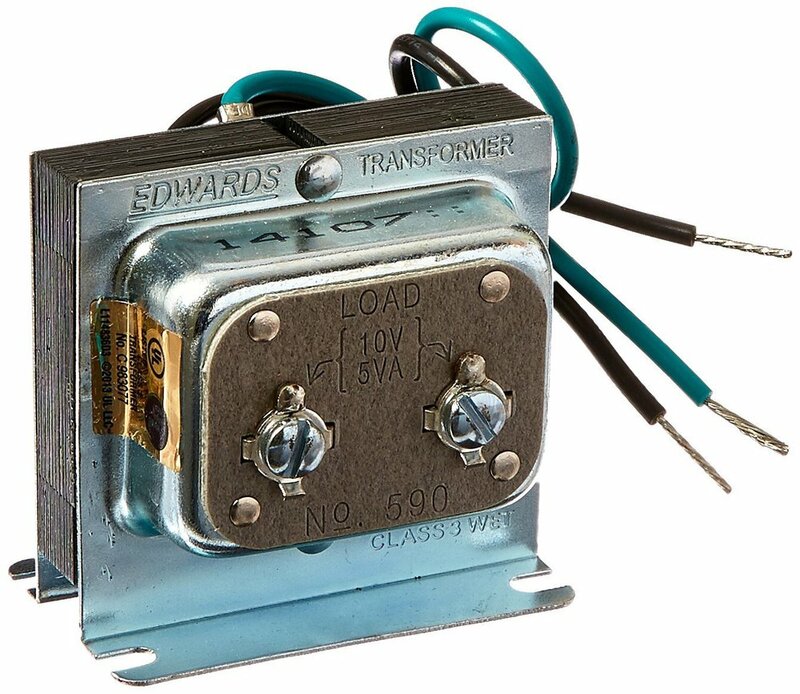 If you have really long wiring runs or multiple doorbells you should get the 24V transformer. If your transformer runs are less than 60-80FT and you only have one doorbell the 16V transformer should be enough power. If you are unsure of your existing wiring length you should use the higher voltage 24V transformer for the Ring Pro Doorbell. Not all 24V transformers have a high enough amperage rating to provide enough power to the Ring Doorbell Pro some have a 24V voltage rating but only put out 10VA (amperage) which wont provide enough power to the ring pro doorbell. We have found a 24V transformer on amazon that puts out 40VA (amperage) and is compatible with the ring doorbell pro. Don't deviate and try to get a cheaper 24V option because the other options on amazon don't have enough voltage. Going with the 24V-40VA transformer option below will save you time and headaches down the road if you have a long run of wiring. This 16V-30VA transformer is compatible with the Ring Pro Doorbell. You can see it also has a 30VA amperage rating in the picture. 3. Install your Ring Doorbell Pro and see what happens. What is the best Wifi System or Router to use with the Ring Doorbell? Once you have your Ring Doorbell installed you want to make sure you have a strong reliable wifi signal getting too the doorbell. If you don't have a strong signal or if it's slow you will have choppy video on the Ring Doorbell or receive notifications from your doorbell with a delay. You won't be seeing the real time footage of what is happening at the front door if you have poor wifi signal strength. Most people don't have their wifi routers right near the front door so it can be a challenge getting a strong wifi signal to the Ring Doorbell. The other challenge is that the wifi signal must extend beyond the inside of the house and through building materials like bricks, siding, insulation and wood. So even if you have a strong signal inside your house it doesn't mean that your going to have a strong wifi signal outside your home. The solution is to get a mesh wireless network system like Eero that will allow you to place a range extender beacon right near your front door if you need it. There are other range extenders and mesh wifi networks on the market but I have found that many of them don't support the bandwidth required by smart home camera or doorbell devices. The Eero shines with smart home cameras and delivers a reliable wifi network throughout your house and outside of your house if you the Eero Beacons on the exterior walls. I personally use Eero in my home and it was the best upgrade we could have made for our wifi system. We have a strong reliable signal throughout the house and I can track the data usage of each device connected to the network to diagnose if there are any issues. Does the ring security system work with the Ring Doorbell Pro? Yes & No. If you are already in the Ring ecosystem the Ring Security system is a good option to increase the security level of your home. You can use the Ring Security System with or without an alarm monitoring package, so you can choose the alarm professionally monitored or you can monitor it yourself which means you will be alerted if there is an issue and it will alarm but you will be responsible for calling the alarm company in the event of an emergency. The security system uses the same app as the Ring Doorbell Pro but does not currently have a combined set of features specifically designed for interfacing with the Ring Doorbell Pro. As time goes on Amazon & Ring will most likely continue to build out the Ring Security & Doorbell platform to include cross over features to unlock additional functionality. At a lower price point than the competing nest security offering the Ring Security System is worth considering if you are already in the Ring ecosystem. We just launched our one hour smart home smart plug, designed and manufactured by us, for you. If you would like to be part of our exclusive reviewer program to get discounts on smart home devices email us at info@onehoursmarthome.com or you can purchase our smart plugs online with the link below. Our smart plugs can be controlled with your phone on our web app or with voice using Amazon Alexa or Google Home. If I live in the UK can I use a plug in transformer with the nest hello doorbell? Can I use a plug in transformer with the nest hello?